Most of us in business post to social media accounts, whether it’s Twitter, Facebook, Instagram, LinkedIn and many others. But many of us post on each site individually, and if you do use a management tool like Hootsuite or Buffer are still not using it in an optimal fashion. RiteKit CEO Saul Fleischman gives us some guidance on how RiteTag, RiteForge, RiteBoost and Rite.ly can make things way easier! RiteTag – Get instant hashtag suggestions for images and text, anywhere on the web and mobile. Must-have for Instagram and Pinterest. RiteForge – Craft, schedule and publish remarkable posts with the auto-magical Enhance button and many other time-saving tools. Rite.ly – Soft-sell on all links you share. Add self-branded Calls-To-Action on links and track clicks and conversions. Exclusive video CTAs available. RiteBoost – Already got a favorite publishing tool? Enhance posts in Buffer, Hootsuite or anything else. Create Enhanced posts in bulk from RSS, Feedly or Pocket. Each of these tools can help you increase your response from your social posts by helping you keep in front of them with custom links, get #hashtag help, and more all from your browser with browser extensions and mobile apps. RiteTag is a hashtag and posting assistance engine that will build a post and suggest relevant hashtags based on the page, titles, images and other factors. These hashtags can be used on any social media platform including Twitter, Instagram, Pinterest and LinkedIn. The RiteTag tool allows the suggested hashtags to be placed at the end of your posts, or even integrated into the copy. You can even choose which language to suggest hashtags! RiteForge is a next-level product compared to RiteTag. It still suggests hashtags, but now you can add animated GIFs, emojis, find influencers and even schedule evergreen content multiple times over the course of days, or even months. It’s still a browser extension is easy to use. Simply click the RiteForge button and “enhance.” There are additional options there. Or, you can highlight text, right-click and “Share with RiteForge” and select from a series of options to use special background options, edit the text, add emojis, preview the post, and then submit to a pre-built group of social platforms, or select them individually. Like RiteTag you can also get suggested hashtags that are color-coded as hot, overused, never used, etc. Finally, RiteForge allows you to schedule when the posts will go out, but also schedule a post to be sent out multiple times. Rite.ly is the default short-URL generator has a number of benefits when compared to other short-url’s like bit.ly, goo.gl, and more. The main benefit is for a customizable popup to be seen by your visitors when they go to the linked page. Some of the customizations include a video popup, some text, ads, and just about anything else. You can even customize the URL to be branded by your own url or a desired URL. Rite.ly works very well with RiteForge. RiteBoost provides the ability to add the Enhance feature across all social media platforms like Hootsuite, Buffer and more. It adds a button on you favorite posting method (Hootsuite for me) that makes it very easy to post and customize your post from your favorite social media program. RiteBoost also provides ways to bring in content from feeds from RSS, Pocket, Evernote, Reddit and many more online properties. As mentioned in the podcast, the RiteKit tools solve some huge time-sucking issues faced by many of us that use social media for our businesses. Finding relevant hashtags, making the posts engaging by enhancing with imagery and emojis, scheduling future posts, using multiple social media sites…all are possible using one or more of the RiteKit tools. Listen to the podcast for more great tips from Saul, sign up, use the tools where you are… on the page, in Hootsuite, in Facebook. Enjoy and optimize your business social media with the RiteKit tools. Have you used any of the RiteKit programs and have some comments or suggestions? Leave them @BeBizzy on Twitter! Reminder, Tax Day is Tuesday, April 17, 2018. WordPress 4.9.5 was released yesterday. It’s a small update, and just a few minor releases before the big one, Gutenberg, gets released. Should You (and your customers) Delete Facebook? Facebook has been accused of distributing “fake news” since before the last US Presidential election. The social platform was supposedly manipulated to send articles to those of certain political leanings re-enforcing those beliefs or inciting anger at opposing beliefs. Recently it has been found that Cambridge Analytica obtained the Facebook data of 50 million users. UPDATE!! I LIED! This afternoon (4/4/18) it was announced the leak was 87 million accounts! Inside that data is your contact info, who you follow, what ads are clicked on, friends, your timeline, and much, much more. So now that the cat’s out of the bag, what should you do as a consumer, and how does that affect you a as a business person? Under the General Account Settings is a link to “Download a copy of your Facebook data.” Click it. You will be taken to another page (page views anyone) that asks you to click another button to “Download Archive.” Click THAT. An email will be sent to your login email stating your Facebook data has been requested, and a followup email will be sent when the data dump is complete. Now if all that information scares you, you’re not alone. And thousands are deleting their Facebook accounts including Elon Musk, WhatsApp founder Jan Koum (who sold his company to Facebook for $16 billion), Jim Carey and more. HOWEVER, before you do, remember that Cambridge Analytica and others already have your info, so deleting your Facebook account will only cut you off from sharing new info. They can already act on what they have. Your customers could easily do the same, and once they see who they all follow, like and interract with, there’s a chance they will also either delete their accounts or remove some affiliations. Instead of deleting Facebook, it’s suggested that users remove allegiances to Apps, Website and Games. You can also see what information is saved as “Your Ad Preferences” , where you can see what’s stored as Your Interests, Advertisers You’ve Interacted With, You’re Information and Ad Settings. But if your customers go here, there is a chance they will “unsubscribe” to your ads and other information. So now what? Well, if they do this, you could lose their attention. So there are a couple of things you can do to retain them now before another scandal prompted them to make changes. Post Often – By putting quality, relatable, non-sale related content in front of them often, you could entice them to think of you as a needed resource, entertainment source, or wanted advertiser. Advertise to a targeted list – Obviously when looking at your data you can see just how targeted your ads could be blasted. Be more selecting when you send out an ad instead of throwing it out to as many people as possible. It will save money and keep other timelines from being clogged. Focus on things other than Facebook. Get your website’s SEO fixed, look at Twitter, Pinterest and LinkedIn as possible avenues of driving traffic, and look at marketing automation as an option. If a user has made up their mind to delete Facebook you will simply loose that method of reaching them. If you have hitched your wagon, traffic and marketing to only Facebook, now is the time to start looking at other solutions. Wish I would have sought this one out a few weeks ago before I moved a very large, active site. What it does is you install Mergebot on both your LIVE site and a DEVELOPMENT site. As your visitors interact with the site with sales, contacts and other things the information is passed through the cloud the Mergebot. Also, as you make changes to the development site these database changes are also sent to Mergebot, where the cloud database combines the two making it easier when the DEV site goes LIVE by syncing all the database changes in one place. It’s not cheap, but if you’ve ever moved a large site or database and had to keep a version live while you migrate or change it can be a huge headache when it comes time to merge the data. Mergebot could help you with this. Cost is $249/yr to migrate one site at a time, $349/yr for three, and $589/yr to do five sites at a time. Again, not cheap, but compared to the hours you could spend messing with database sorting and merging, it could be a lifesaver. Wish I would have used it before I migrated the last site, but I won’t make THAT mistake again! Audits. When one thinks of that word it brings to mind some guy sitting in your office sifting through receipts, bookkeeping notes and interviewing your employees on processes. But what if you could use an audit form something good, like increasing your marketing efficiency? That’s why you would perform a social media audit on the various platforms you are using to market your business. This article was a great starting point to the next few weeks when we will talk about optimizing profiles and pages for your Twitter, Facebook and LinkedIn pages. This is the perfect time of year to do a social media audit to prepare for next year. Now that you’ve audited the general items of the individual to make sure everything looks and feels the same, it’s time to start looking at Google Analytics for indicators that visitors to the website are coming from the various social platforms. You can also get some valuable information from the social media platform data. In addition to using the social media analytics to perform a social media audit, you can also use third party tools like Hootsuite and SEMRush to analyze data from social media websites. The point of doing social media is to create awareness, gain followers to frequency, and that activity drives traffic to the site to sign up for email newsletters and subscriptions, then convert those subscribers. Determine what “success looks like” for your business and see what sites are meeting that success model. Sometimes it’s better to abandon/close a social media platform if you are unable to manage that platform or your audience just isn’t there. Set up a schedule to perform this social media audit quarterly or at least regularly to look for trends on what is working. Video is going to be the dominant form of media in social media in the coming years. Video doesn’t have to be polished to be effective. Just needs good camera placement, decent content and great sound. Create a list of FAQ’s, answer them, and make 1-2 minute videos answering those questions and share in your social sites. Do you want to be seen as a thought leader? Then consumption of social and website content is the goa. If you want to create awareness, strive for reach… how many people can you reach with each post..
Shares, likes and retweets are to be used if the goal is to reach more with word of mouth. There is a documented trail of each post to see how many people see it, share it, like it, click on it, and even purchase because of it. Don’t expect immediate results! Sometimes you are talking to no one until your acquire a following. But there is a benefit to talking to no one in social and blogs because the post lives on and can be found by people searching for the content keywords. Googe+ is great for SEO benefits, even if your customers aren’t there. Performing a social media audit can take a bit of time, but if you do it once you will produce a baseline that will enable your business to compare to when making future decisions on digital marketing. Both Donna and I encourage you to take the time between now and the end of the year to audit your social media properties. Don’t forget to check out Donna Amos’ article on “How to Perform a Social Media Audit” at her website, and follow her on Twitter to stay informed. Have you done a social media audit? What were your experiences and what actions did you do after the audit? Let me know at BeBizzy.com or @BeBizzy on Twitter! Don’t forget to send us any suggestions for apps to review or people to interview. And subscribe to the BeBizzy Break Podcast on iTunes and Stitcher Radio. And as always, leave the technical stuff to us! On Episode 59 of the BeBizzy Break Podcast, we talk about the passing of another geriatric internet property, Compuserve, a renewal of the browser wars with Firefox Quantum, and why your technology is good enough. Joins Microsoft Paint and AIM as old tech services being shut down in 2017. The service will be terminated on December 15, 2017 and odds are if no one would have said anything, you never would have known. New browser from Mozilla that promises to be faster, and use less memory. And while there’s something to be gained with tech that works better and faster, your current technology might be already good enough, or could be made so with a few minor tweaks or upgrades. Replacing the battery, if possible, or carry an external battery or recharging device. Clear up memory by deleting apps, using streaming audio and video services, and uploading photos to free cloud services like Google Photos, them deleting the local files. Run Updates – Make sure you’re running the most recent operating system and app updates. Having everything updated makes it easier to troubleshoot and work together. Factory Reset – Things still running slow? Sometimes it’s just best to flush the system and start over with a new operating system install. Keep in mind you will lost all of your data on the phone, so back up and connect to cloud services. Improvements like the Microsoft Surface, Chromebooks and even iPad Pros are blurring the lines between computers and mobile, but even they “promise” to be able to do what you can already do with a computer, just smaller and lighter. Both “major” operating systems, Windows and iOS have promised no major upgrades anymore, just incremental updates. Hard Drives have become so large it’s hard for a vast majority of users to come close to filling it up. Add RAM – Memory is cheap, and of all the things to replace requires the least amount of technical know-how and time. RAM is easily accessible in desktops by removing the case, and most laptops have a cover to remove to get at the RAM and maybe the HDD. Major products like Crucial have scanners and selectors to make sure you’re getting the right memory to upgrade your device. HDD – Have an old or small hard drive? There’s a real good chance that your HDD is a spinning disc, and believe it or not, it’s WHEN it will fail, not IF. Check out Seagate or Western Digital to find a suitable replacement. You can also migrate less often or large files to an external drive for a small price and they easily connect to your current computer via USB. To the Cloud! – Get your photos and other important files uploaded to a cloud service like Dropbox to ensure ease of access & transfer, and also security in the event of a hardware failure or catastrophic office event. Responsive Design – Have a site that is old and doesn’t work on a smartphone or smaller screen? Might be time to update to a responsive website. CMS like WordPress – Maybe it’s time to take over the management of your own website. WordPress allows you to post your own pages, a blog, and more. Search Engine Optimization (SEO) – Maybe you’re site is all set up an running as you need, but you’re just not getting found on the internet. By optimizing your SEO and your Local Business Listing you increase the chances of being found by potential customers. Social Media Marketing & Training – Like SEO, your website might not be the problem, maybe it’s just getting the word out. Social Media offers an easy way to engage your fans and followers and market to new clients. We are constantly hit with marketing messages on stuff you “NEED” to ensure you have the most current technology or your life will be horrible. Vehicle enhancements like rear hatches that open with your foot, lane change chimes, and others are safety features, but really just being a better driver will fix that. 4K and 3D TV’s are wonderful, but there is little programming that takes advantage of the technology. VR goggles are fun toys, but again, there’s very little cool, productive programming for them. And voice controlled devices like Google Home or Alexa are neat, and have a utility to them, but often you have a device in your hands or pocket that can do the same thing. I LOVE technology, and our economy relies on constant updating of computers, furniture, cars, homes and just about everything else. But sometimes saving that money for something else is your best bet. Have any questions or suggestions on using current technology instead of buying new gear? Leave them below, or send them to me @BeBizzy on Twitter! In this episode we talk about how overcoming WordPress objections, the iPhone X, Skype and an update on my Pixel 2 XL phone. Happy Birthday to us! Today is BeBizzy Consulting’s 9th anniversary. Happy to be around and serving our clients in website design, hosting, marketing and search engine optimization for many years and looking foward to the future! Have you already overcame WordPress objections in your organization? Contact BeBizzy Consulting today and let’s get you on the web! The iPhone X, 10, whatever hits the streets on November 3rd, so buckle up! Listening to a review from TechRadar the reviewer claimed he had “cinematic” sound from the dual speakers. I’m gonna call B.S. on that one. Tinny smartphone speakers will never sound cinematic. Not seeing any performance issues, screen burn-in, or anything else. This phone is FAST, has a great signal, good (not cinematic) sound, and Android Oreo is stable and easy to use. I don’t think this will work in a typical office setting, but in an enclosed office or home office it works great. How this topic emerged was I was listening to podcasts, as I usually do while I work, and was listening to “Adam Ruins Everything,” a podcast that accompanies a TV show of the same name on TruTV. It’s hosted by Adam Conover and in the podcast they conduct more in depth interviews on a particular topic than the TV show allows. One of the tech “Backfire Effects” is WordPress is simply an insecure blogging platform. While at an advertising agency, I was brought in to argue “against” WordPress because we sold a custom-made CRM. It was one of the toughest things I’ve ever done, and is frankly one of the reasons I chose not to work for that company any longer. Security – There’s a ton of holes and it’s a highly visible platform that many people have found ways in. Limitations – Every WordPress site looks the same. Buggy Code – The code is managed by the community, so who knows if it’s well written or efficient. Search Engines – SEO is impossible on the WordPress platform. Out of the box it doesn’t allow you to format the code and meta information in such a way that Google and other search engines and index the site properly. Plugins – Use quality, high-ranked plugins that have been updated and work with your version of WordPress. Limitations – Probably the biggest challenges to overcoming WordPress objections are themes. There are tons of customizable themes to use to give your WordPress site a unique look. Buggy Code – There are millions of users looking for and submitting bug fixes, so normally they are found and repaired before penetrating the real world if the code is properly updated. Search Engines – Yoast and other SEO plugins are much more efficient in formatting and presenting content for the search engines. So overcoming this WordPress objections is reallly easy. Hosting – There are now dedicated hosts for WordPress sites which allow one-click installs, install updates, speed enhancements, and more. You CAN get what you pay for, but you can also be paying for that fancy office, over-hyped software and computers, desks, food, etc. Sometimes you’re just paying more because they’re charging more. Scott Wild, the Onboarding & Employee Engagment specialist at NISC and owner of the Wild Trivia Tour, joins the podcast to talk about planning and budgeting for a new website. Scott and I have done several podcasts and other projects together in the past, including working for the same advertising agency in the same role a few years apart, so there’s no one I trust more when it comes to planning and pulling out the steps for a new site. Websites are now the storefront of most businesses. It used to be billboards, newspapers and then television ads, but now many consumers find you online. So it’s important to have a user-friendly site that funnels potential clients through the buying experience. It’s not unlike how grocery and department stores are set up in that you walk through the store to get essentials, then back through everything again before being shown the “add-ons” at the checkout. You should find out what your visitors want, get them there quickly, then take them through the desired path while still serving their needs. Planning Meetings : planning up front will decrease development time (and therefore cost) and get you the site you want. For each audience, “where do they itch?” Or what do they want/need to find on your site? What do you want them to do right now? What’s the call to action? What CRM? WordPress? Drupal? A specialized CRM that’s built for your industry? Custom build? What’s the best fit for your business or organization? There are many criteria for hosts including cost, operating systems, server specs, bandwidth speed and limitations, and many, many more. Choosing a good host can be a determining factor when Google and other search engines rank your site. For example, my DJ business is BeLoudEntertainment.com, but I also own BismarckWeddingDJ.com. OWN YOUR DOMAIN! This can be important when you want to move the website, or just to make sure the domain is handled correctly for updating. Your domain name is just like your business name. Keep it safe! Starting this October, any site that asks for passwords or credit cards NOT using an SSL will be flagged as insecure by Google Chrome (60% browser market share). Just like your domain, own your SSL if possible. Is affected by proper titles, descriptions, keywords, page content, page layout, links (inbound, outbound and internal), page load speed, server response speed, and more. Social Media sites like Facebook, Twitter, LinkedIn and YouTube are critical in sending good traffic back into your website. Use them correctly and often. If you really want to make a splash, there are large volume marketing pieces like Spotify or other campaigns that can be fired up, but most have a minimum spend. Make sure the site is backed up and has some security apps or plugins monitoring the site. This is critical when, not if, something bad happens. There were so many other items to discuss on this podcast, but in many cases it’s better to discuss in person or over the phone. If you have questions on developing a new website, or would like to discuss in more detail, please call 701-214-6271 or contact BeBizzy Consulting and let’s find out how we can drive more customers to your website. 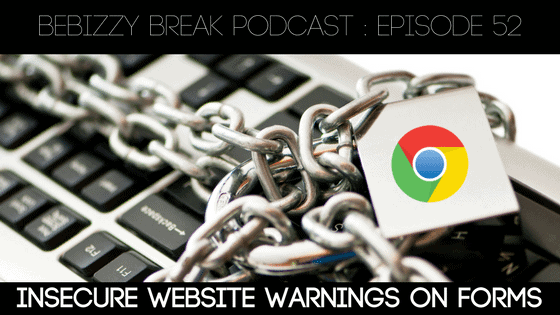 In this episode we talk about upcoming Google Chrome warnings that will be displayed for website forms not protected by SSLs and a little about Dropbox Paper. Users can now preview Dropbox Paper docuemnts before opening them. Very helpful for admins or project managers. Usera can also now create folders on mobile devives and move Paper documents to them. Great for those of us who work on phones or tablets a good portion of the time. And finally, users can now delete files on their mobile devices. A little less useful for many of us IT guys and creatives who NEVER delete anything, just archive it. Google Chrome will now start displaying a “Not Secure” warning on webpages not protected by an SSL and including a form asking for passwords or credit card information. This means that if your site requires or requests any of this, the warnings will be shown to potential clients and other visitors. I believe this is an incremental step towards Chrome requiring all sites to have SSLs in the very near future, with the next step probably being that ANY form will need to be protected by an SSL. This is a great time for you to get ahead of the inbound wave by activating an SSL on your site as soon as possible to take advantage of the extra search weight assigned by Google for sites with SSLs. It’s also a great chance to take a look at current forms on your website and maybe change them to ask additional questions you may have ommitted due to not having and SSL in the past. Keep in mind there are some obstacles beyond cost to purchasing and installing an SSL. More to come on that in a future episode. Have you joined a Twitter chat? What has been your experience if you have? Are you ready to host a Twitter chat? One of the biggest big advantages of the Twitter platform is for large groups of people to unite around a common topic to entertain, educate and provide a common voice. Leveraging that to learn about a topic is a great way to keep up with just about any category or specific subject. But joining a Twitter chat can be a little tricky, and for many of us, scary. First of all, forget the scary part. You can join without anyone even knowing you’re there, so let’s just get that out of the way now. So that leaves the technical part. It’s usually as simple as following a hashtag. Tools like Hootsuite and others allow you to both follow a hashtag, and even create a seperate stream with only that hashtag, which makes it really easy to play along. Participate! Ask questions, submit answers, share slides and other media . The biggest waste of your time will be to sit and watch the chat go by with nothing contributed by you. Follow people to interact with you if the content is valuable, entertaining, or helpful. When responding make sure you use the #Hashtag to ensure the admins and other followers can see your question, response or generate statement. This will allow everyone to use or respond to your post. Maybe it’s time you’ve finally created your own Twitter chat. You have a following, you have a topic, now you just need a vehicle to get your message to the masses and maybe use it to drive education and maybe even revenue! If you are looking to build a community and host a Twitter chat there are also a few things to consider. Recruit a few ambassadors to help you with the chat by attending all of them, RT’ing invites and posts, and participating with answers and follow-up questions. Pick a hashtag that is unique, easy to remember and is about the topic. Use the same hashtag on every chat, every notice, and every recap. Schedule it when you think a large number of followers can attend. Many of the small business chats above are in the mid-evenings when fewer people are working, it’s after dinner and many of us would be watching TV or doing other leisure activities. Chats targeting moms might be mid-afternoon when the kids are at school or taking naps. Prepare your questions, answers and related information in advance, and maybe even schedule in Hootsuite or other tools to make sure the timeline is followed. Interact with other users as they share and respond to your questions. You never know what will come up or be revealed. Prizes are a great way to get people to attend and interact. Guest hosts can add a bit of energy into the chat with a new voice and their following. Don’t be afraid to change things as they emerge. If you get some feedback that a different time/day will work better, or more or less of a type of content works better or worse, make changes. 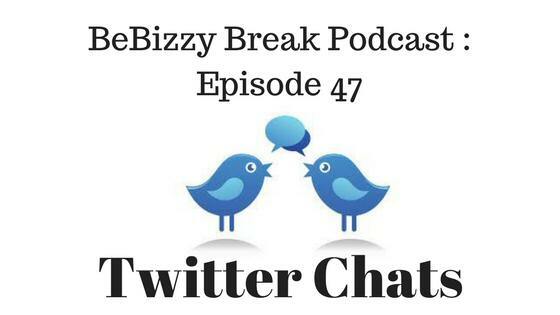 Twitter chats can be a great way to stay informed of changes in a variety of topics. They can also be used to show your expertise in a subject, and network with a very significant group of experts in your field. Search one out and join a Twitter chat today and who knows, maybe tomorrow you’ll be leading your own Twitter chat! 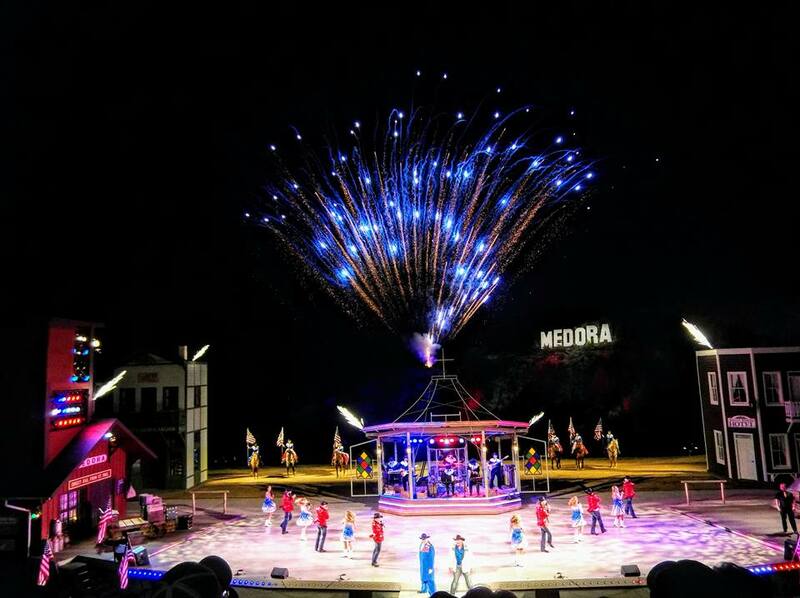 And as promised, photos of Medora, ND. You own your business name, your equipment, maybe you even own your building. But I bet many of you don’t own your digital business presence. I’m talking about your domain names, your social media pages, Analytics and more. Google Business Listing – Make sure you use an email address owned by the company to create and manage the business listing. By not doing this, I’ve seen the process become very involved just to change the hours of operation. Google Analytics – Same as above… use an email address belonging to the business to create this account. We’ve had an issue where we could not move an account to a client and therefore couldn’t use the existing account to manage everything without creating a new Analytics account. Social Media – Picture this… you fire the employee in charge of social media. They created YOUR page with THEIR account, and therefore “own” it. Now, in order to make sure that previous employee doesn’t post negative information, or simply for you to continue to post as your business, you have to go to them and have them transfer ownership. Awkward! Create your own social media pages/accounts, and invite others to contribue. Then you can manage who gets access. Domain Names and SSL’s – Your domain name is one of the first things potential customers can see. If you don’t technically “own” it, then moving it can be a long, and sometimes impossible process. Lease your own domain names, and SSL certificates to make sure you know when they are up for renewal, and can easilyl change everything in the event you move or change hosting. If you’ currenty don’t own your digital business presence or properties, my suggestion is to get them as soon as you can. You never know when your current vendor will be leaving the business space, you lose critical employees, or even if YOU are planning on selling and need to transfer ownership. Need some help getting this handled? 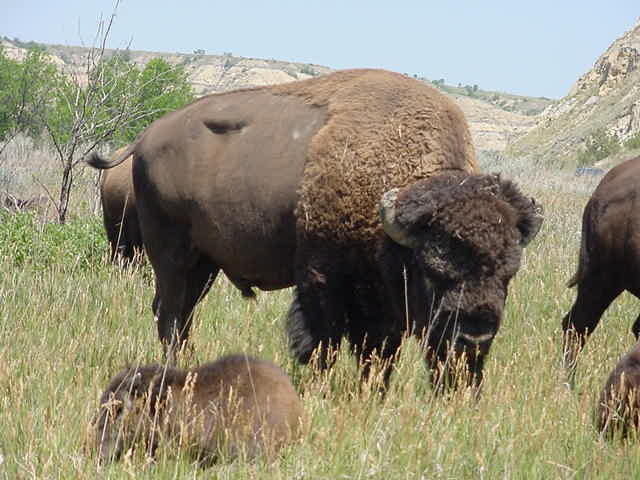 Contact BeBizzy Consulting at 701.214.6271 or at BeBizzy.com and I’ll be happy to help you out! Have any questions or suggestions for future podcasts? Leave them below, or send them to me @BeBizzy on Twitter! Part of the intrigue of social media was the ability to interact with your friends, family, co-workers and other like-minded people throughout the world. Unfortunately, sites like Facebook have been reduced to vehicles to segment ourselves by political beliefs, brand support, or even what we find funny. But what if I told you there was a way to use Facebook to be better at your job, your personal hobbies, or just things you enjoy? That’s what Facebook Groups can do. Facebook Groups are a vehicle that like-minded people can use to distribute and discuss issues, problems and ideas. Some are totally secret, some have to approve new members, and some take any and all members that wish to join. Groups can be a nice distraction from your general Facebook feed and a great place to bounce ideas, get uplifting support, or maybe even some constructive criticism. The way most people participate in groups is by joining several groups. As I stated earlier, there is a group for nearly ANY interest. I’ve joined groups for small business owners, WordPress development, mobile DJ’s, Brittany dog owners, local wedding vendors, motorcycle riders, hunting/fishing, and much more. In each of these groups there are other people with at least one similar interest and will communicate on questions or comments regarding that interest. 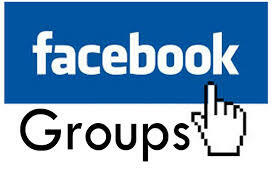 If you belong to other groups, online or not, find out from other members if they have joined other groups on Facebook. Join several similar groups, then quickly determine which groups are useful and which are not, then unsubscribe the ones that don’t fit your needs. Be active in the discussions. Ask questions. Provide answers. Input some humor into the group where applicable. Be… nice….! Not finding a group that fits exactly what you need or want? Create your own Facebook Group! It’s free, the creation process is relatively easy, and the result can be very fulfilling. However, be advised that owning a Facebook Group can be a lot of work depending on your subject, your members, and your personal goals for the group. A group can be created for nearly any topic of interest. Have a tool you use for work, a hobby you spend a fair amount of time learning, or just an obscure skill? Start a group and see if there are any others with the same interest. Do you have time to spend managing the group? Are you going to approve everyone interested, or is there a manual process involved to allow users access? If you are going to approve new members, do you have a documented criteria of what is needed in order to join? Once approved, do you have a method of monitoring the posts and comments in order to discipline, or eventually remove users from the group? If you don’t have time to monitor, are you willing (able?) to let others monitor the discussions for you? How will you attract new members to the group? Other social media channels? Other online media (podcasts, YouTube)? Traditional media like radio, TV, newspapers or magazines? Or are you going to just allow search and word of mouth to attract visitors? Facebook Groups can be a powerful, useful piece of your social media services. But, if used too much, or without restrictions can end up being a distraction in an stream already cresting its banks. Find topics useful and interesting to you, join them, or create your own, and you will start seeing some benefit from Facebook beyond the usual birthdays, lunch posts, and meme photos. In episode 43 we talk about some of the things listed here, and expand on them a bit. We also talk about my Samsung Chromebook Pro, which I started using last week as my out-of-the-office computer. Check it out below, or subscribe to the podcast.